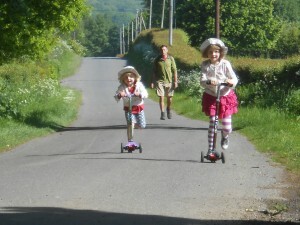 Here is the Nihola trike in action! Gary (my burdensome ballast) is holding aloft the certificate I have just received at the finish of a local charity bike ride. (I was raising money for Molly's primary school). I am looking a bit out of puff as I am very pregnant with Jack who was born not long after this ride. It was lucky I didn't give birth to Jack on one of the 1:4 hills on the ride - although the trike's front box could have doubled up as a useful emergency birthing suite. 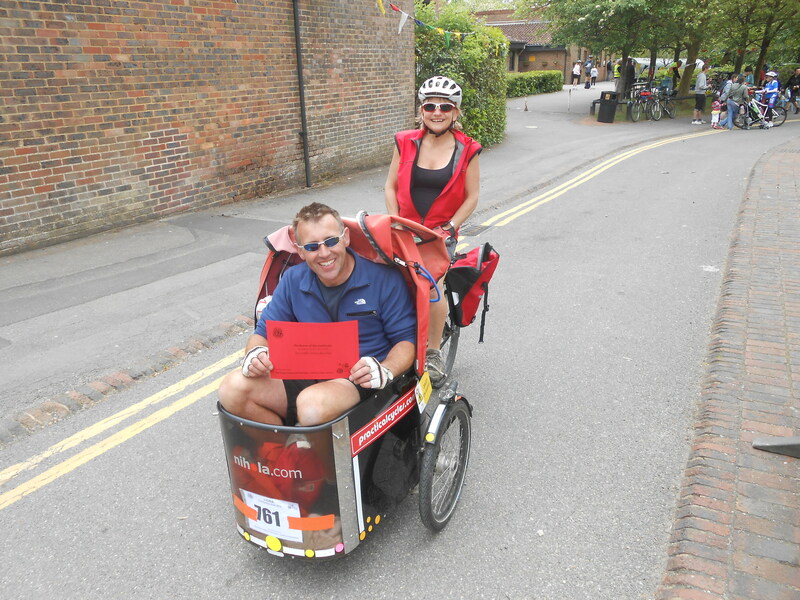 To push young Jack (who will be 11 months old by the time we set off on Operation Pram Push) in a pram the 100-mile length of the South Downs Way during Molly’s summer school holidays (start date: about 25th July. Finish date: end of August/beginning of September). If the pram-pushing mission goes to plan Jack will have his 1st birthday on top of a Down. And Molly will have her 8th birthday on top of another Down. Molly has quite sturdy cycling legs so hopefully she will be able to walk about 4-5 miles a day up and down a Down. The conundrum is 4-year old Daisy. How many miles of Downs does she have in her legs? On current walks she has a fixation with collecting a?lorry-load of feathers and leaves and sticks and stones and rocks the size of her head. And there’s only so many rocks my pockets will hold. Ideally Gary (the building husband) would come too so that he could carry his fair share of rocks. But he’s too busy building in August to come on a merry goose chase with us over hill and Down. Gary thinks the whole idea is crack-brained which is quite reassuring as he thinks most of my ideas are crack-brained. And he’s probably right. But that’s no good reason I tell him not to do it. We will be camping most of the?way? which means a lot of clobber attached to a pram and to some sort of trans-Antarctica sledge on wheels. How am I going to manage all this singlehanded? Well, I’m not! As I won’t have my husband I need a? ?temporary husband who I seem to have found in the form of a temporary wife called Anoek.? Anoek is Dutch and lives in Utrecht and she seems strangely enthusiastic about the whole idea. ?She also has a 4-year-old daughter (one week older than Daisy) who is coming too. I think Mila also likes to collect rocks so it may be an idea to take a dumper truck with us on this pram-pushing escapade. Hence conundrum Number 2. How to move two four-year-olds forwards? Plus a Molly. Plus a baby. Anoek thinks she has the answer. Anoek has a sort of husband called Pek and who the girls call Jesus (he looks like Jesus). But as Jesus doesn’t like walking or camping he’s staying put in Holland. So Anoek is coming on this pram-pushing circus with her temporary husband called Guust but who the girls call Goose as we English can’t properly pronounce Dutch Guust (it involves a lot of throaty garglings). I have yet to meet Goose. All I know about him so far is that he has a wife who doesn’t like walking or camping and that he has a beard and teaches PE. Oh, and he also juggles. I think it is Goose’s juggling?acts that Anoek thinks will fascinate the girls so much that they will?run after him as he walks along juggling. And as they run mesmerized by the sight of so many airborne balls they won’t notice the Downs pass beneath their feet. And so the miles will pass. Or so we hope. Operation Pram Push would probably be quite easy (and fast) if the South Downs Way tracks were country lanes like this as Molly and Daisy shoot along like rockets on their scooters and Gary and I have trouble keeping up with them. But that's the joy of the South Downs Way - it's footpaths and bridleways not roads. So the tricky predicament remains: how to keep the girls moving forwards? Don’t focus too much on moving forward. Focus on fun and recreation. You only need to do 5 to max 6 miles a day. You have the whole day to do that distance. Furthermore if the way takes loads of height meters just make the day distance even shorter. It’s a different cookie moving from ‘fun’part to the next ‘fun’part the trying to get the complete distance done before afternoon. Realize that diner can be done also before setting up camp or having reached the camp site. Remove all hurry and prestige from your body only then true enjoyement can be reached (whoah I get philisophical here). What are ‘fun’parts? Special plants, rocks, animals like insects, old buildings, sights etc. Furthermore you can do little games during walking games like guessing what somebody else is seeing, or word snakes in certain categories. Like naming animals, next animal starting with last letter of preceding animal. Collecting stones, nuts, flowers etc. Let them collect what they want but limit them to their designated ‘budget’. Full is full and they can decide for them selves what gets thrown away to make space again. We hanged two children buckets on our cart for this collecting purpose. Bucket full? well just make it more empty… Furthermore due to the swinging of the buckets they never really got that full 😉 BTW change the fixed heft of a bucket into a cord, it performs better in dangling on something on a cart. Those buckets where also great for washing and the ocaissional nigthly pee on a campsite. May you have wonderful weather, very few rocks and can you actually camp near the path? i seem to think that you have to get off it to do that. not that i Know anything at all about the South down Walks, being here in OZ. Garry is right, you’re crazy, but hey,who cares about that if you have fun.